Americans for Legal Immigration PAC (ALIPAC) is filing a formal complaint today with the Federal Elections Commission (FEC) asking for a full investigation and relief from what the organization believes is illegal manipulation of US elections by Silicon Valley companies like Facebook, Twitter, and Google, who are using censorship, bans, and shadow bans aimed at conservatives to make illegal contributions of value to pro-Amnesty Democrat and GOP campaigns. 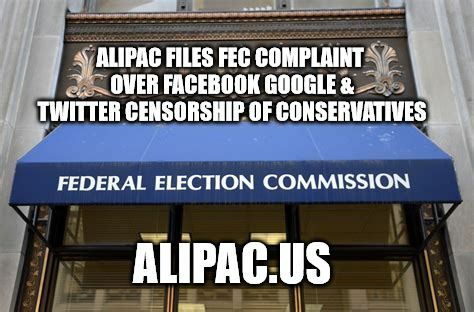 This formal complaint to the FEC follows ALIPAC's 12-page report titled ALIPAC Report to Congress & Media on Social Media Company Censorship (view) being added into the Congressional record on October 10, 2018, which contains detailed information on ALIPAC's experiences with Silicon Valley censorship and suppression since 2012. ALIPAC contends that Facebook, Google, and Twitter are violating US elections laws 11 CFR (Code of Federal Regulations) sections § 114, § 114.2, and § 114.9, which prohibits corporations and corporation employees from contributing any services or anything of value to elections and campaigns. Silicon Valley companies are contributing to Democrat campaigns by silencing conservative opposition to illegal immigration and groups like ALIPAC that support the conservative anti-Amnesty opponents of left-wing candidates favored by these companies. § 114.2(a) states, "National banks and corporations organized by authority of any law of Congress are prohibited from making a contribution, as defined in 11 CFR 114.1(a), in connection with any election to any political office, including local, State and Federal offices, or in connection with any primary election or political convention or caucus held to select candidates for any political office, including any local, State or Federal office. " The ALIPAC FEC complaint alleges that Google, Facebook, and Twitter companies and employees are breaking US laws by using their company technologies, equipment, and employees to contribute to campaigns and influence the outcome of US elections, legislation, and policies in favor of left-wing positions they share with the Democratic Party and Democrat candidates and certain Republicans who also support increases in foreign labor visas and Amnesty legislation backed by these companies. The leadership of these companies have all publicly stated they support Amnesty legislation for illegal immigrants which ALIPAC opposes, and they have created an umbrella campaign wing through organizations like Facebook's FWD.us. While their companies seek to support candidates and campaigns that share their views on immigration, they are simultaneously using their company resources to suppress and hinder ALIPAC and many other conservative pundits, bloggers, candidates, and voices. While these companies target large numbers of organizations and networks on the right of America's political spectrum, they barely hinder groups on the left including ANTIFA which is allowed to remain on Facebook and Twitter despite being classified as a domestic terror group and making numerous threats against the lives and property of conservatives and President Trump according to Far Left Watch. "The documentation is piling up rapidly showing these companies are engaged in a wide pattern of censorship, shadow banning, and unequal services and products offered to Americans based on our politically conservative creeds," declared William Gheen, President of ALIPAC. "The result of these collective actions of these powerful Silicon Valley based companies, often acting in collusion with each other, is to silence and restrict the protected political freedoms of American conservatives engaging in individual or grassroots political action. We believe their bias and influence is clearly designed to affect the outcome of US elections on behalf of the Democrat party and this violates US laws designed to protect US citizens from undue corporate meddling in elections." Americans for Legal Immigration PAC hopes the Federal Elections Commission will respond to these complaints thoroughly with full investigations, and that other American groups and individuals will also file formal complaints with the FEC on these matters. Last edited by ALIPAC; 11-02-2018 at 12:04 PM. Last edited by Airbornesapper07; 03-21-2019 at 12:17 AM. G00gle Twitter Facebook etc will be used not just to filter content. It is a beta test for Google Dragonfly which keeps Chinese users locked down monitored and censored. Anything you say or even think against the Zionist global agenda will be used against your social credit score. It will also be used to manipulate so called elections. The g0vernment is counting on the majority of American citizens not to vote out of disgust with both so called parties. They are flooding the country with these illegals so they will be there new majority constituents and these illegal aliens who will be granted amnesty will all vote for the government who gave them a free ride. The senators and congress are all compromised. There are no options left and as you can clearly see. You can never compromise with a psychopath or sociopath. So where do we go ? Where do we go now ? Last edited by EvO 98; 03-21-2019 at 07:42 PM.